Peter Petherick's death in Perth this week brought to mind the realisation that the prospect of late developers getting an opportunity in cricket are more likely the exception rather than the rule in the modern era. 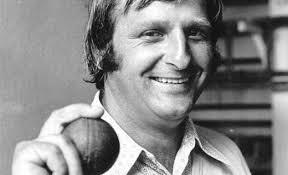 Petherick, an off-spinner, who took a hat-trick on his Test debut – one of only three players to achieve the feat, had a long wait before being called out of Central Otago, at the age of 33, for the first-class summer of 1974-75. He took 42 wickets, in a stunning debut season, and was selected for New Zealand's tour of Pakistan and India in 1976. In an interview with Petherick, who had by that stage moved to Paraparaumu, for Wellington's Evening Post he told me he had never given up hope of playing first-class cricket. "I was just waiting. Jack and Gren Alabaster were dominating things down south. But I was always keen to play first-class cricket because you don't know your limitations until you play at that level. "It's the same when you move up to Test level," he said. Not that the transition to first-class play from the Hawke Cup cricket he had been playing was any jaunt. Petherick was so concerned two weeks before his first match, against Canterbury, that he rang Glenn Turner for some advice. Turner invited him down to his Dunedin home to stay until the game. "I knew I could do well because I could turn the ball. But Glenn got me to move my line over from off stump to middle and leg. I took three of the four wickets to fall in Otago's first game before rain set in and I was right," he said. Then making his Test debut in Lahore he found himself wicketless for 96 runs and wishing he was away back home in Central Otago. The only comfort to him was that he was getting slaughtered just like all the New Zealand bowlers. "That's the thing over there. You can bowl a lot of maidens but then you can concede a lot of 12-run overs," he said. But just when things looked darkest, a spot of light shone on his misery. "Javed Miandad and Asif Iqbal had recovered the Pakistan innings but then just before tea, Javed tried to put a ball over the fence and got only a top edge to Richard Hadlee standing by the square leg umpire." Petherick had a notable first wicket in Test matches. "Wasim Raja was next in and came down the wicket. I was bowling around the wicket to him and he hit it straight back to me for the caught-and-bowled. "Intikhab Alam came in and I never even thought about the hat-trick. The players were crowding the bat. "As I went back to my mark I thought to myself, 'If I was Intikhab Alam I would come down the wicket' and so I darted one in to him. He got a glove or a hand to it and Geoff Howarth made a great catch. "Everyone appealed and as I turned around to the umpire he was unmoved. "I thought he wasn't going to give it, but then his finger went up. "However, it was only after Intikhab had walked that he did it," he said. Rajah and Intikhab had not been named in the side originally and when they were dismissed the crowd went crazy because one of their players had been left out of the side. Petherick had his own version of umpiring abilities in Pakistan and they weren't related to the reluctance of the umpire to give a decision on his hat-trick ball. "At one stage I was batting with Andy Roberts and I was out three times, but not given. Then when I was given out, it wasn't out. "The umpires were not cheats, they were quite nice people and were under a hell of a lot of pressure, they were just incompetent." Petherick played six Tests for New Zealand, taking 16 wickets at 42.81. In first-class play of 52 matches he took 189 wickets at 24.47 with a best performance of 9-93.